This article is about the boss from Donkey Kong Country Returns. For the enemy from Super Mario Sunshine, see Strollin' Stu. Stu is the third boss in the game Donkey Kong Country Returns and Donkey Kong Country Returns 3D. He is the boss of the Ruins area, appearing in the level Ruined Roost. Stu is just an egg before he is hypnotized by Gong-Oh. After being defeated by Donkey Kong and/or Diddy Kong, Stu's "armor" will further crack, causing him to fall down, and then fall apart exposing his torso, resulting in Donkey Kong and Diddy Kong comically placing their hands on their eyes to avoid looking at his body, yet peeking anyways. Stu is a giant red bird with blue and yellow-tipped feathers and blue talons. He has a big yellow beak, blue eyes, and purple eyelids. Stu wears a golden crown with a jewel in its center. He has a bare pink torso that is covered with a golden cauldron filled with bombs (although the presence of red, white, and blue feathers when it breaks would imply that the bare torso was not natural as much as his feathers dislodging from the forceful destruction of his golden cauldron). Stu's most basic attack is throwing three bombs. These bombs usually take a while to explode. However, occasionally, Stu will throw a bomb that will explode rather quickly. At half health, Stu will throw a rocket bomb with a yellow skull face. This will blow up when collided, and create flames that move through the whole arena. After Stu is hit once, he is able to swoop down. The only way to avoid this is to duck or be between two pillars. After Stu is hit three times, he will throw a huge missile in the middle of the arena, which will explode and cause an explosion to destroy the bottom part of the pillars. Donkey and Diddy Kong must either jump over the explosion, or stay on the gold part of the pillars. He will also throw multiple bombs. Most of these are already orange and will explode shortly. Occasionally, Stu will send some Tiki Pops to go after Donkey Kong and Diddy Kong. They will explode shortly after. To defeat Stu, Donkey Kong and Diddy Kong will have to throw bombs at Stu. Once Stu is hit with bombs six times, he will be knocked unconscious and Donkey Kong can defeat Gong-Oh. This fight is quite reminiscent of the first phase of the combat between Mario and Bowser in Super Mario World. 3DS Donkey Kong Country Returns 3D (05/2013) In the Ruins area, Gong Tiki puts a mysterious egg into a golden cauldron and then jumps in after it. Five seconds later, the newly hatched chick breaks holes for its wings and legs and takes to the air. When Stu chucks bombs from his cauldron, pick them up and return the explosives to him. It's only fair, right? 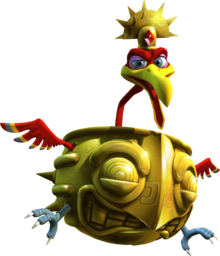 Deep within ancient ruins, Tiki shaman Gong Oh drops an egg into a golden cauldron, and magically causes it to hatch. Out of the egg pops Stu, his wings and talons busting through the cauldron. He's got bombs in there, and he loves to throw them. Chuck them back at him before they explode! Donkey Kong throws a bomb at Stu. Stu dives at the Kongs. Stu releases a lot of bombs. Stu loses his cauldron armor, exposing his body. Spanish Condorado Pun on condor (condor) and dorado (golden). German Bomberich Pun on Bombe (bomb) and Kranich (crane). His name might be a pun on stew, as he has a cauldron as his armor. Of all the bosses in Donkey Kong Country Returns, Stu is the only one who can't be jumped on to defeat. Similarly, Stu is also one of only two bosses who did not provoke the Kongs beforehand by eating/transporting their banana hoard prior to fighting them, the other being Mangoruby. His music is only 1 of the 3 boss music that can be unlocked, the others being Mangoruby's music, and Tiki Tong's music. This page was last edited on October 8, 2018, at 14:12.